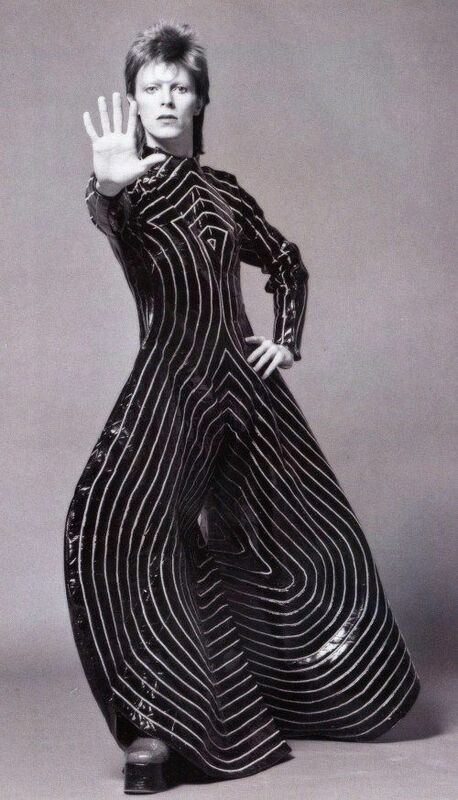 A inspiração para este conjunto foi o irónico fato de David Bowie para a Aladdin Sane tour em 1973. As riscas pretas e brancas e linhas curvas do macacão estão presentes na saia que estou a usar e os sapatos de plataforma lembram os de David Bowie. Kansai Yamamoto foi a primeira designer japonesa a ter um desfile em Londres em 1970 no qual esteve presente David Bowie com apenas 24 anos . As roupas do desfile eram inspiradas pelo teatro Kabuki e David Bowie transpôs isso para o seu estilo e performances, onde a androginia estava presente. Como não podia pagar os designs originais de Kansai Yamamoto, Bowie pediu a amigos para criarem versões mais baratas das suas roupas. This look was inspired by the iconic David Bowie suit for the Aladdin Sane tour in 1973. The jumpsuit’s black and white stripes and curvy lines can be seen in the skirt I’m wearing and the platform shoes definitely remind us of David Bowie’s. Kansai Yamamoto was the first Japanese designer to have a runway show in London in 1970, which David Bowie attended when he was only 24. The garments from the show were inspired by the Kabuki theatre and Bowie passed that on to his style and performances, where androgyny took part. Because he couldn’t afford the original Kansai Yamamoto designs, he asked friends to create cheaper versions of the clothes. Previous Post » Run, Forrest, Run! A saia é mesmo gira, super diferente do habitual! !